1 of 4 Heat oven to 350 degrees F. Coat two 8-inch round cake pans with nonstick cooking spray. Line bottoms with parchment or waxed paper; coat paper with spray. 2 of 4 Mix flour, baking powder, cinnamon, nutmeg, ginger, cloves and salt in large bowl. 3 of 4 In another large bowl, beat together butter and sugar on medium-high speed for about 3 minutes or until smooth and fluffy. Add eggs, one at a time, beating well after each addition. Add vanilla and walnut extracts and beat until combined. Beat in flour mixture alternately with milk in three additions, beginning and ending with flour until combined; then beat for 2 minutes. Fold in nuts. Divide batter equally between prepared pans. 4 of 4 Bake in 350 degrees F oven for 30 minutes or until wooden pick inserted in centers comes out clean. Cool cakes in pans on wire rack for 10 to 15 minutes. Turn cakes out onto wire racks. Remove paper from bottoms. Let cool completely on rack. 1 of 1 Stir together brown sugar and water in small heavy saucepan. Bring to boiling. Remove from heat. Stir in rum. 1 of 2 Place 2 tablespoons Simple Syrup in small dish. Sprinkle gelatin over top. Let stand until softened, about 5 minutes. Stir to dissolve gelatin, heating slightly in microwave if necessary to completely dissolve the gelatin. 2 of 2 Beat cream in bowl until frothy. Add gelatin mixture and vanilla extract. Beat on high speed until soft peaks form; use immediately. 1 of 3 Slice each cake layer in half horizontally to make total of four cake layers. 2 of 3 Place one layer on cake plate. Generously brush with Simple Syrup. Spread 1 cup Whipped Cream over top of layer. Evenly distribute about 1/3 of 1 cup glace cherries over top of Whipped Cream, gently pressing cherries into cream. 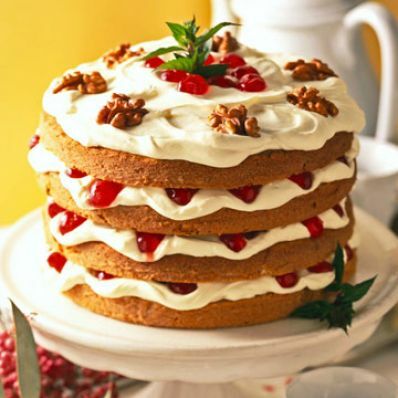 Repeat layering with remaining 3 cakes, syrup, Whipped Cream and glace cherries. Spread remaining cream over top. 3 of 3 Garnish with an additional 1/4 cup glace cherries, the walnuts and fresh mint sprigs. Refrigerate at least 1 hour before serving.